Climate change is one of the most serious issues facing the world's cities in the 21st century, but so far policymakers, planners, and scientists have come up with few solutions to prevent—or mitigate—its calamitous effects. While flooding disasters like Hurricanes Katrina and Sandy have brought attention to the dangers posed by stronger storms, there are plenty of other threats—such as rising sea levels—that might be even more pressing. Wildfires and drought have already heavily damaged the American Southwest, while flooding threatens low-lying island nations. Here are a few cities that will soon be in danger. 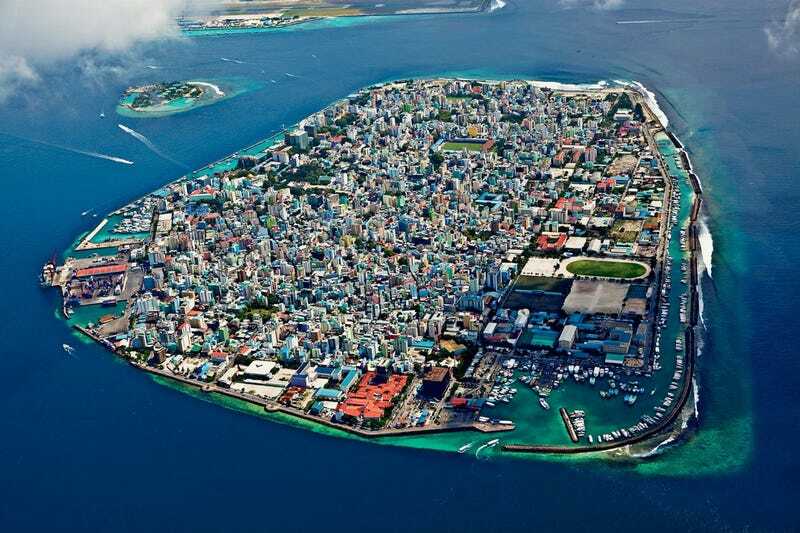 The capital city of this archipelago nation occupies one small island, which will soon be overwhelmed by rising sea levels. The former prime minister of the Maldives went as far as to try to buy land in other countries for his citizens to resettle. This plan is not going forward, though with an average elevation of three feet above sea level, the nation is running out of time. The city's dependence on drought-stricken desert waterways is leading to disaster, as several million people drain available resources. When the water runs out, will the city wither? Dust storms are already a problem, and dry conditions are leading city governments to encourage residents to tear up their lawns. The residents of this small Alaskan island are slated to become the first climate change refugees. The narrow spit of land is normally protected from erosion by sea ice, but the melting of this ice means that the land is slowly disappearing. See what will happen to New York, Las Vegas, Dhaka, Venice, and more. Will Le Corbusier&apos;s Chandigarh Fall To Ruin?